I have been practicing this without knowing it! but not without sacrificing a significant amount of earning potential. and I can surely say I am very happy that I did so. Not the point of this exactly but I thought it was really encouraging for a work obsessed Japanese culture that a decent percentage of those polled define their ikigai as not their work. I’m hoping that it leads to a bit more balance. I’ve got friends working there and though I’ve always had a strong work ethic, the expectations for them even take me aback! I think its a good concept. 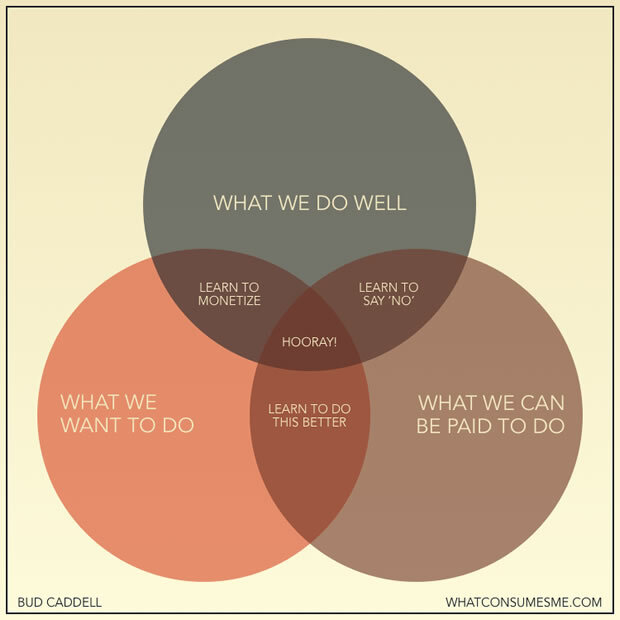 I also like the point that people don’t necessarily find their Ikigai in their jobs. However, to nitpick… I think the graphic might paint a unrealistic picture. I think theres much more overlap in the 4 items. For example, the graphic seems to imply that you can only be paid for about 1/2 of what the world needs, or conversely that 1/2 of the jobs aren’t needed. But I’d counter that 90%+ of what the world needs is stuff that you can be paid for and 90%+ jobs are necessary things. Of course I don’t think we’re supposed to take the graphic as drawn “to scale” but its just to illustrate the point. However as it is, the graphic makes it look like finding Ikigai is very rare as it occupies a small % of all things.